The maker of Nutella recently settled a class action lawsuit that claimed people were buying its chocolatey spread without realizing just how unhealthy it was. The lawyers claimed that consumers assumed the dark spread was healthy, even though its first two ingredients are sugar and oil — hardly ingredients list trickery, unlike the lies pulled by many other food makers. Whether or not you’ve been duped by Nutella’s marketing team, it’s not the only option out there when it comes to delicious spreads for toast or bagels. Instead of a PB&J, try an AB&J. Almonds are an extremely rich source of vitamin E, a potent antioxidant that helps defend your cells from all the pollutants that your body is constantly bombarbed by. Almonds can even help guard against heart attacks. Celebrate Halloween all year! Pumpkin seed butter may sound a little strange and spooky, but it’s delicious and a very high source of omega-9 and omega-6 fats, as well as vitamin K. Plus, pumpkin seed butter is okay for people who suffer from nut allergies. 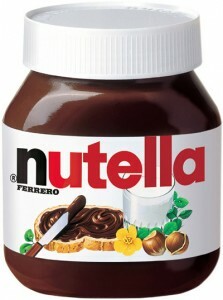 Nutella brags about its hazelnut content, but these nuts actually make up a relatively low proportion of the product. Try making your own chocolate hazelnut spread at home by combining a cup of hazelnut butter with a tablespoon of cocoa powder and a couple teaspoons of vanilla extract. Hazelnuts are high in vitamin B6 and healthy unsaturated fats. Are you struggling with cholesterol problems? In various studies, pistacios have been shown to reduce LDL cholesterol numbers. Try pistachio butter for a nutty, rich alternative to standard nut butters.